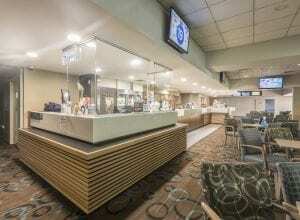 Nulex Construction is thrilled with the results of the recently completed major renovation of the café and bathroom facilities at Raymond Terrace Bowling Club. With years of experience completing club projects, Nulex understands the importance of working with the club to minimize disruption during construction. 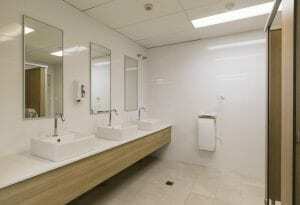 This was very important for this project as it involved closing toilets to renovate them and closing a section of the bar. 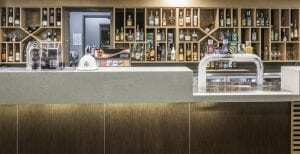 In order to minise the impact on operations a hoarding was put around the section of the bar where the new café was built and noisy works were kept to a minimum during trading hours. Tasked with the design and construction of a new café and the modernisation of the male and female facilities, Nulex worked closely with architecture firm Lewis & Zwart to realise the vision the Club had for its updated facilities. The café features beautiful timbers including a stand-out Tasmanian Oak bar front and the extensive use of slatted timbers throughout and a stone bench top across the serving areas. 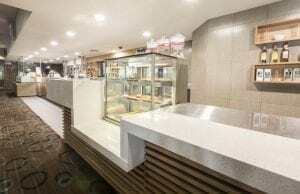 The bar is equipped with new wine and bottle racks and a Billi water dispenser, while the café now has a functional coffee area and an expansive cake display area. 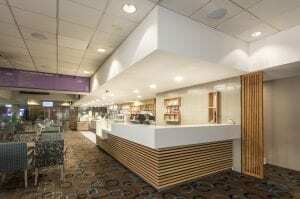 The renovation required the reconfiguration of the bulk head and a new layout for the bar. Full height feature tiles across the rear wall give the room a great feeling of depth, and the epoxy flooring and stainless joinery round out the new contemporary look of the space. 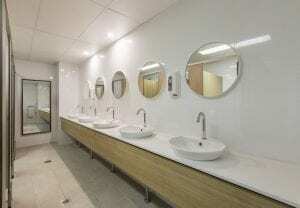 The male and female bathroom facilities have had a complete makeover and now feature opulant stone bench tops with timber vanity’s, sensor tapware woodgrain grid ceiling tile and timber feature screening in the male amenities. Nulex is proud to have built on our earlier work at Raymond Terrace Bowling Club when we completed an upgrade to the outdoor area and gaming facilities. They say a picture is worth a thousand words and we think the images from this reno are on the money! It is always a privilege to deliver quality outcomes for our clients. 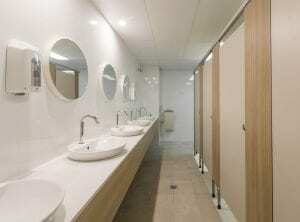 If you would like to know more about the commercial refurbishments we undertake, please get in touch.